NEKO or Wacky rig the lures vibrates all-over when a shake action is applied, yet stays in the one location for pinpoint appeal. When fished on a standard jig head rig or used with an Italian rig (i.e. offset hook setting with nail sinker inserted in head section) it keeps the perfect shape on fall and produces a fine vibration when swimming to attract and entice nervous big bass. 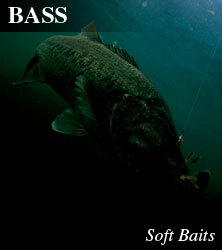 Made from material infused with NORIES encapsulated taste and scent formula for longer bites and stronger hook ups. This is achieved by putting a nail sinker in the head of the plastic on a standard offset hook setting. This is a new rig style that when fishing on flat areas in weedy sections allows the angler to fish effectively with jerk and fall actions. When Norio Tanabe was fishing with locals in Italy he came across this style of fishing, and slightly arranged the rig they used to create the "Italian Rig".